Greetings guys! I hope everyone had a fantastic weekend. Happy on a Monday? You must think something crazy is going on but no I'm just excited to show you a little something. Actually I've been wanting to show you these beautiful polishes for over a month but due to a month-long leave I thought it'd be best to wait for the reopening. Although no date has been given, Supernatural Lacquer is back! Oh how I've missed Stefanie's amazing polishes. Supernatural Lacquer and its polishes are based on the hit television show Supernatural. If you're a fan of the show then you'll definitely get a kick out of these polishes. Today I'll be sharing four polishes that were released a few months back, one of which was a special limited edition. 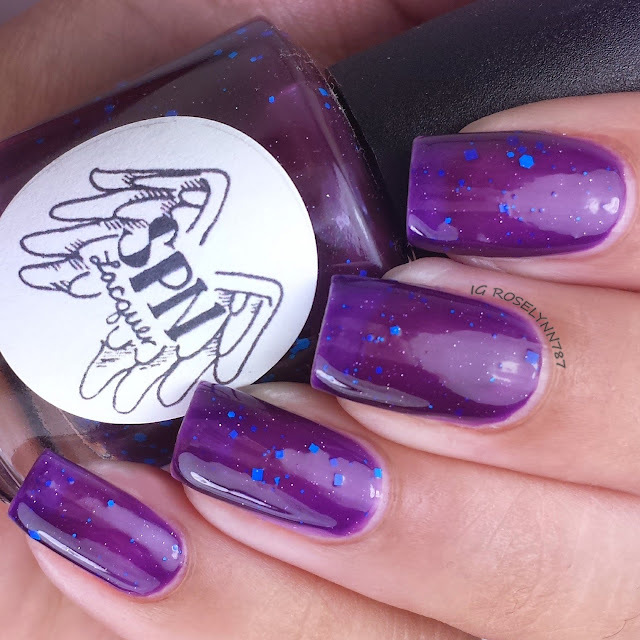 Purple Nurpled is a dark purple jelly polish filled with teal-colored glitters. I don't think I have to say it but I will anyway, I love this name! This polish was released as a limited edition back in May along with a few other prototypes. I'm not sure if this polish will be brought back but I really hope it is because it's truly an amazing color combination. Swatched over a clear base coat, used three thin coats, and sealed with a fast drying topcoat. You'll find this beauty to be sheer in one coat but I achieved full opacity within three coats. 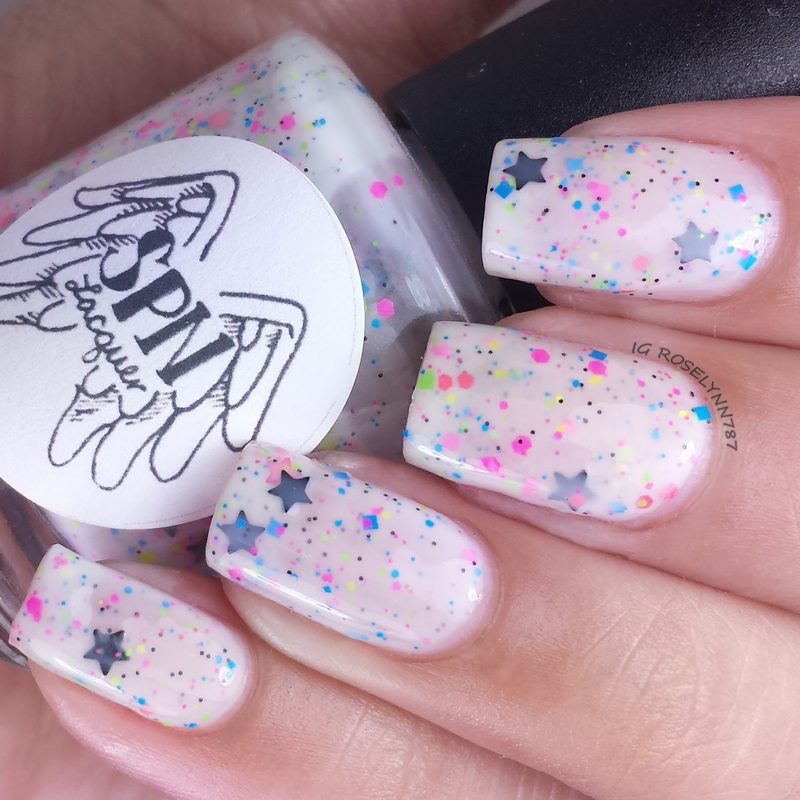 Jefferson Starships is a white crelly filled with neon glitters and black star-shaped glitters. This polish was available as a glow-in-the-dark version and a non, this is the non-glow version. For some reason, in these photos the base doesn't look as white. I think it's my cameras fault, good thing I'm getting an actual Canon camera. Out of all that I'm reviewing today, this one is my absolute favorite. 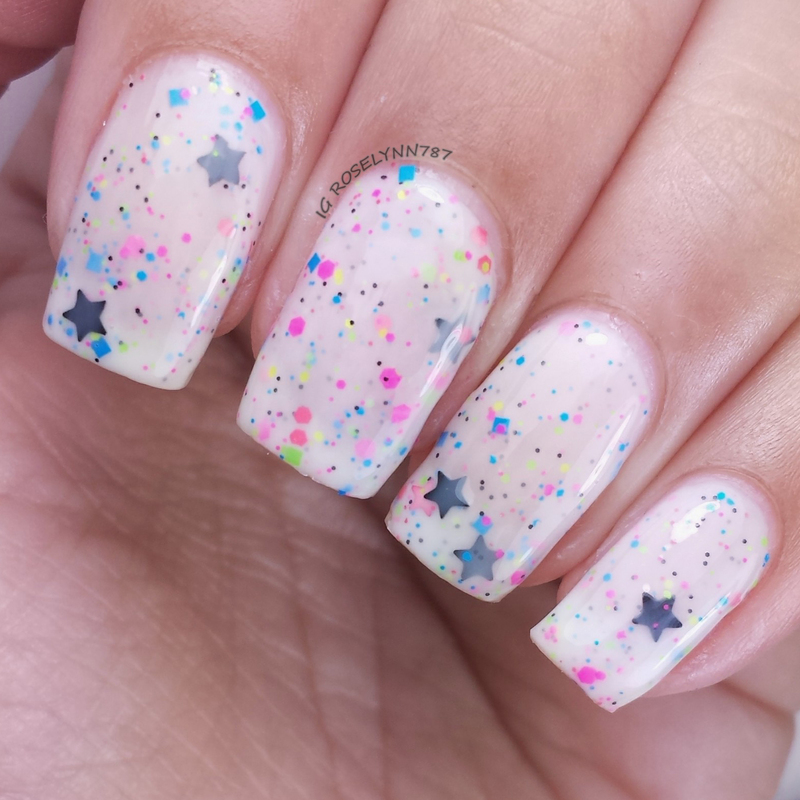 The neon glitters on white are very stunning! Swatched over a clear base, used two thin coats, and sealed with a fast drying topcoat. Great formula and consistency, I had no trouble applying. There was also no need to fish for glitters when it came to the star-shaped ones. Idjits is a clear glitter topper filled with black heart-shaped glitters, as well as, blue and green hex glitters in various sizes. I'm a huge lover of glitter bombs so this one was right up my alley. 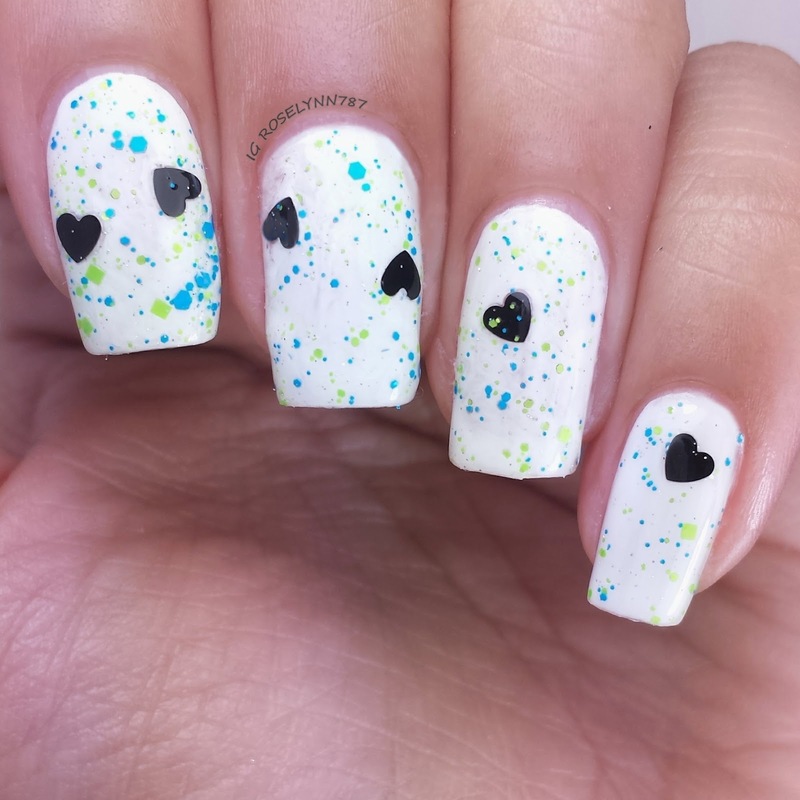 The black heart-shaped glitters are a cute touch. Swatched over a white base, used two thin coats, and sealed with a topcoat. Great formula, I experienced no issues whatsoever. The best part about this glitter topper is the fact that I had to do zero glitter fishing. Yellow Fever is a white crelly filled with black dot glitters as well as yellow and black micro glitters. All these white crelly polishes are making my heart swell. There is seriously not another kind of polish that I love more than white crellies and this one makes a great addition to my growing collection. Swatched over a clear base coat, used two thin coats, and sealed with a fast drying topcoat. Another great formula and consistency. No problems to report here. Saying no glitter fishing is an understatement for this one. I actually found myself putting glitter back because each brush stroke was so overwhelming, haha. Overall these polishes are great quality, consistency, and formula wise. Polishes with larger glitters usually tend to be hit or miss, these are all out of the park hits. As a huge fan of the show Supernatural, I think the best part for me is knowing the references behind the names. It's definitely something that keeps drawing me over and over to the polish line. As I mentioned before, Supernatural Lacquer is currently still on a hiatus. 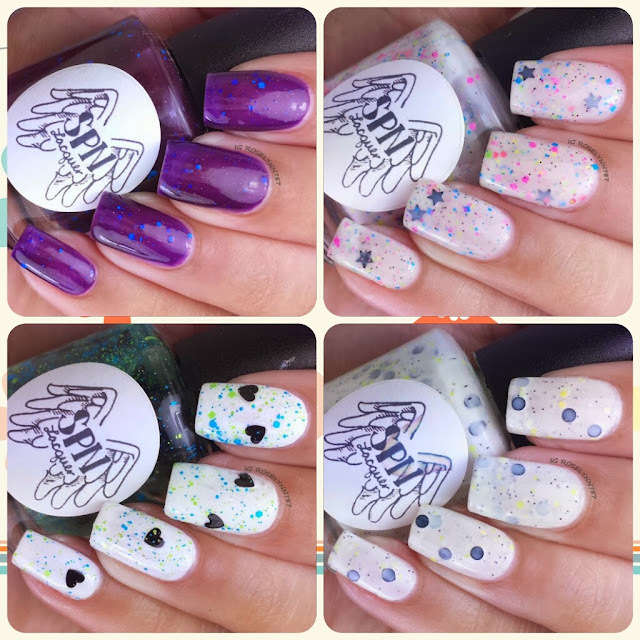 Stefanie, owner of Supernatural Lacquer, has returned to posting on Instagram and has mentioned restocking polishes as well as coming up with some new ones for the relaunch. As soon as I find out a date I'll let you guys know. Follow Supernatural Lacquer for her grand reopening of the store coming soon! Don't miss out guys as I'm sure she's working on some marvelous creations.